Ullal is a panchayat town in Dakshina Kannada district in Karnataka. It is a small town about 8-10 km south of Mangalore close to the border between the two southern states of Karnataka and Kerala. It comprises two revenue villages Ullal and Parmannur in Mangalore Taluk. Ullal is located adjacent to City Corporation of Mangalore at a distance of 10 Km from District head quarters. Ullal is very famous for historic locations like Someshwara Temple, Summer Sands Beach Resort and Queen Abbakka's Fort at Ranipura, Seyyad Madani Dargah. This quaint little sea town on the shore of Arabian sea was the setting for wide scale sea-erosion that occurred in the late 1990s and early this millennium. The local authorities however have tried to reduce the damage by placing sand bags near the advancing coastline, the benefits of this step are yet to be noted. Adjacent to summer sands beach resort is Subhash Nagar. The remains of Rani Abbakka's fort can be seen in the vicinity of Someshwara Temple. Ullal is an important trading centre for fish and fish manure. Fishing and Beedi rolling are main occupations of the residents of this town. This Town was the Capital of the Tulu Kingdom Ullal and was ruled by Rani Abbakka Devi in the middle of the 15th Century. Abbakka Rani of Ullal can perhaps be proclaimed the first promoter of Women's liberation. A regular firebrand, the people of Ullal look upon her with much pride. A Jain Princess of 16th century, she came to the throne on the death of her sister. She was married to the Bangar King of Mangalore, but the marriage was not a success. In a few years the couple was estranged with the queen returning to her beloved Ullal. The reason for the grouse was, the queen was averse to the payment of subsidy demanded by the Portuguese. While her husband continued to be subservient to them, the queen was openly rebellious. Relations between the Royal couple steadily worsened and finally ended with divorce, with the queen returning all the jewels to her ex-husband. War was declared and the queen was captured while on a sailing expedition on the Nethravathi. Taken prisoner she was presented before her husband. However on this one occasion the queen thought discretion the better part of valour and with all her womanly charms got the Raja of Bangar to set her free and return all her lands to her. The Raja went so far as to avow his eternal friendship to her. But hardly had she reached the precincts of her own kingdom then she vowed to wage war on her husband once more. For this she sought the help of the powerful Raja of Bednore. The Bangar Raja had meanwhile enlisted the help of the Portuguese to subjugate his wife. The Raja of Bednore being an opportunist was only too ready to enter the fray. The Bangar-Portuguese alliance was defeated with the Bangar Fort raised to the ground. The queen had to part with the fertile tract of land at Berdatte to the Bednore King for his support. Having successfully defeated her husband, the queen now turned her attention to the Portuguese with whom she maintained her unconciliatory attitude. Several punitive expeditions were sent against her, which she repulsed successfully with the help of the Zamorin of Calicut. Another expedition sent under Jaoa Piexoto in 1566 ended in disaster for the Portuguese. With only her Moghveer warriors she surrounded the Portuguese frigate at night. Using stealth and cunning, she took them by surprise and inflicted a crushing defeat on them. Incensed by the defeat made all the more insulting at the hands of a woman, the Portuguese sent a veritable armada under the leadership of the Portuguese Governor himself. While the queen met with initial success, she was betrayed, so some say, by her own people for a casket of silver. However, the army of the queen was thoroughly outnumbered. What ensured was a bloody massacre with the queen escaping to the hills, a fugitive. Another version has it that the queen had taken her own life rather than give herself up to the enemy which really seems more in keeping with her character. Pietro Della Valle, a renowned traveller and historian of the 16th century, seems to have been fascinated by her. Her militant nature aroused his interest and he made several attempts to meet her. His efforts finally met with success when he accidentally came across her in the bazaar. His foreign mein and dress elicited her interest and with the aid of an interpreter, courtesies were exchanged and an invitation issued to visit the royal palace. Della Valle was enamoured of "her perfect dignity, handsome feature and exemplary assiduity. Active and vigorous in actions of war and weighty affairs. Even at night she was not free to take rest but dispensed justice to her people." His description of her is at once romantic and realistic. He puts her age down at 40, dark complexioned and with elegant figure. At another instance, he says she could be mistaken for a common kitchen wench, but for her graceful and judicious speech. Her scanty clothing of only a loincloth may have created this impression. He seems highly impressed with her administrative qualities and doesn't give much credence to the rumours of her having poisoned her elder two sons, who were aspiring to the throne. One can see the ruins of the fort she built around Somanatheshwara temple. This temple houses few things related to the Queen Rani Abbakka. There is an old Jain temple (basadi) in the town which belongs to the queen. 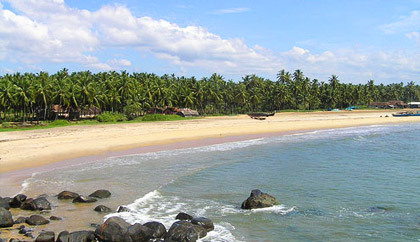 Ullal was one of the major ports of the western coast in the pre-colonial era.